Product Description: The Amprobe SM-10 Sound Level Meter is designed to meet the measurement requirements of Safety Engineers, Health, Industrial safety offices and Quality Control in various environments. It offers two types of measurements: A and C weighting. The A weighting is for general noise sound level and the C weighting is for measuring sound level of acoustic material control in various environments (ie 94dB 1 kHz etc...). 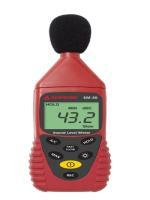 The SM-10 conforms to the IEC651 Type 2, ANSI S1.4 Type 2, and JISC1502 requirements for Sound Level Meters. Which means the SM-10 uses two different weighting filters required by the IEC 651 and ANSI S1.4 Type 2: the A-Weighting and the C-Weighting audio filtering.